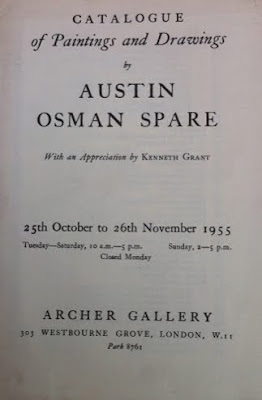 The spirit which permeates the artistic creations of Austin Osman Spare may not be easily ensnared or examined, for it is exceedingly tenuous and elusive, as fugitive as the odour of a rose and as cloyingly nostalgic. ...here are not only the creations of an artist gifted beyond the normal, but these very creations themselves are the true delineations of a realm of being existing here and now at a level of awareness veiled to the uninitiated vision of the generality of men. One might almost say that far from being fanciful products of a highly trained and vivid imagination, these works represent faithful recordings of those latent levels wherein and wherefrom proceed the motivating causes of all the complex and inscrutable mentations, fragments of which only appear within the limited orbit of the so-called 'rational' activities of the mundanely conscious individual. 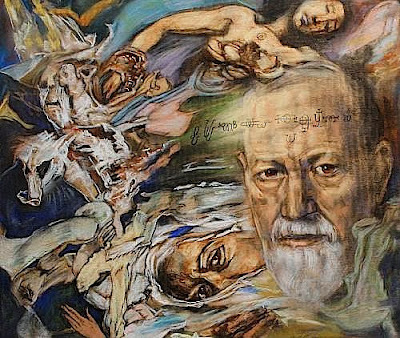 We have to understand not only the mysteries of dream and of sleep, of waking consciousness and the mechanism of desire, but also we should have direct experience of the 'knower' of all these various states of consciousness before we can begin to understand the fugitive essence of Spare's enchanted creations. For even as the universe is a glamour cast forth from and by the mind of man... so also these creations subsist as realities within a deeper consciousness than is manifest in the everyday waking activities wherein the human machine lives and moves. From regions which make these activities seem merely automatic reactions to external phenomena, Spare brings the tenuous thread of his dream into the reality of day, and makes the dream-intrusion into waking awareness a subtle perichoresis of two worlds as remote and apart from each other as the outward form and appearance of man himself is to the soul which exists in the veiled sanctuaries of his unknown realities. As for 'perichoresis' (which Grant is using metaphorically) some definitions are the length of a short story and there is even a video about its meaning and pronunciation, but put simply it is a term used in the theology of the Trinity to indicate the intimate union, mutual indwelling, or mutual interpenetration of the three members of the Trinity with each other. 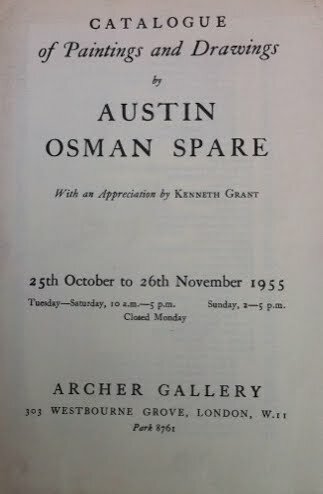 By the way--the pamphlet must be worth £50+ and works by Grant can go for up to £400. 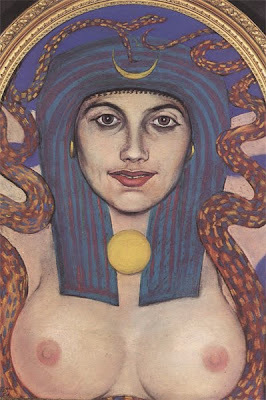 The colour Goddess image was later used for 'Man Myth and Magic' in the 1970s. One of the few collectable part-works...The portrait of Freud was item 151 in this 1955 catalogue of 221 works and was priced at 10 guineas, probably worth a little north of 2000 guineas now (he's not Frank Auerbach) but a decent investment. Thanks to the Cabinet of the Solar Plexus who display this fine slightly sidereal painting. You forgot to mention the Eleohant.